We at St Hilda’s are aiming for excellent attendance for all our students. Mrs Bulmer is our Attendance Officer and her role is to work with families and students to prioritise excellent attendance. Punctuality is also really important. 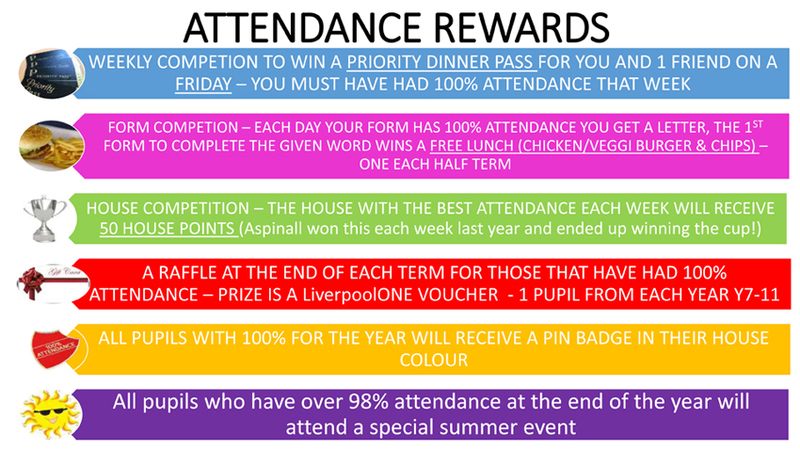 As part of our rewards and celebration, we are rewarding excellent attendance and punctuality on a weekly basis by adding points into the rewards account of every student at St Hilda’s! The graphic below shows the difference types of attendance rewards. As a parent you will be aware that a pupil’s absence during term time can seriously disrupt their continuity of learning. Not only do they miss the teaching provided on the days they are away, they are also less prepared for lessons after their return. There is a consequent risk of underachievement which you must try to avoid. The table below shows the impact of absence on attainment at GCSE. Missing just one week in Year 10 and one week in Year 11 can have a negative impact on GCSE results. Data from DfE research report, ‘The link between absence and attainment at KS2 and KS4’, published March 2016. Pursuant to Section 444 of the Education Act 1996 a parent can be prosecuted for their child’s unauthorised absences from school. A Penalty Notice Fine can be used as an alternative to prosecution in a range of situations where unauthorised absence occurs, as outlined in the School’s Attendance Policy. Please click here to view the School’s Attendance Policy. It is important for you to be aware for future reference, that new legislation has been introduced in respect of holidays in term time (The Education (Penalty Notices) (England) (Amendment) Regulations 2013. From the 1st September 2013 the new law does not grant parents an entitlement to take their child on holiday during term time. Any application for leave must only be in exceptional circumstances and Head Teachers must be satisfied that the circumstances are exceptional before they can warrant the granting of leave. However, Head Teachers are not expected to class any term time holiday as exceptional.